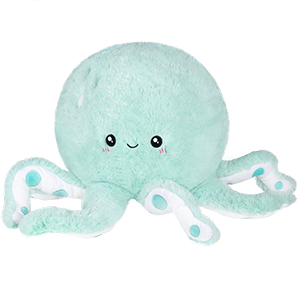 Squishable Mint Octopus: An Adorable Fuzzy Plush to Snurfle and Squeeze! Sometimes you need the refreshing taste of minty toothpaste to really wake up in the morning. Not working? How about some minty iced coffee, minty cool air, or that hipster down the hall who calls herself Minty instead of Mindy because she's cool like that? There's only one thing that will do the trick every time: a minty hug. From a minty friend. With many minty teal arms - or are those legs? Anyhow!! This adorable cephalopod�s sweet smile and invigorating attitude will be the breath of fresh air we need! 8 legs perfect for hugs! This is probably the one animal squish i had my eyes on, i am more of a food lover but the eyes on this big guy caught my eye. I fell in love with the color and the face. Once i saw it in stores i fell even more in love and had to have it immediately. He sits by my pillow every night. I already have a full-size squishable (the storm cloud), so I had a vague idea of just how big he would be, but I was still surprised when I took him out of his package. What can I say? He looks almost identical to the picture, he needed a bit of fluffing, but he did just get shipped across the country in a bag, and tbh, I would probably need a bit of shaping after that treatment too. But once I fluffed him like a pillow he was PERFECTLY round, super soft, very huggable in shape.